Polyspell is a spell that when casted enable the wizard to use a spell of lesser level than the polyspell from his repertoire (a short list of known spells). So there will be Polyspell I (a 2nd level spell) to Polyspell VIII (a 9th level spell), differently from a lesser wish or wish spell the Polyspell can be used only to cast spells from the mage repertoire and only using the required components (you cannot cast a Fireball w/out bat guano for example) and paying the requested penalty from the spell (if for example you use a Polyspell VII to cast a Limited Wish). In short you sacrifice an higher level spell slot for the flexibility of being able to decide which spell to use at the moment of casting. The repertoire of a spell-caster is equal to 3+number of spell slot. So a 3rd level magic user (2 1st level spell slot and 1 2nd level spell slot) will have a repertoire of 5 1st level spell and 3 2nd level spells). A spell repertoire is permanent until changed, to put a spell in his repertoire the mage must take 1 week per spell level and spend 1000 gp in various materials, furthermore the mage needs his spell book with the spell to be put in the repertoire on it. Once in a repertoire spells can be memorized (or locked see: Recharging Spell a Vancian optional system) without the spell book, this is a good reason to have a repertoire even without a polyspell ready. (this option can be ignored by the DM). Description: When the spell-caster cast this spell the effect is to be able to cast another repertoire (see before) spell of 1st level. Description: When the spell-caster cast this spell the effect is to be able to cast another repertoire (see before) spell of 2nd level or less. Description: When the spell-caster cast this spell the effect is to be able to cast another repertoire (see before) spell of 3rd level or less. Description: When the spell-caster cast this spell the effect is to be able to cast another repertoire (see before) spell of 4th level or less. Description: When the spell-caster cast this spell the effect is to be able to cast another repertoire (see before) spell of 5th level or less. Description: When the spell-caster cast this spell the effect is to be able to cast another repertoire (see before) spell of 6th level or less. Description: When the spell-caster cast this spell the effect is to be able to cast another repertoire (see before) spell of 7th level or less. Description: When the spell-caster cast this spell the effect is to be able to cast another repertoire (see before) spell of 8th level or less. It's been a few years since a lot of system have incorporated the "sorcery" spell system, a sorcery system is a spell-casting mechanic where spell-casters have a short list of ready spells, a repertoire in ACKS terms, and they have spell-slots to cast them. 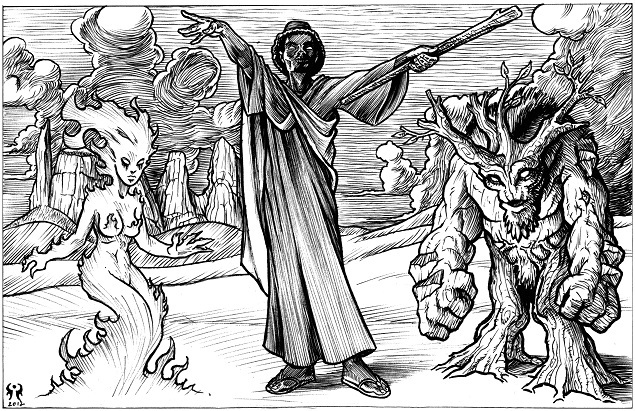 First seen as the special feature of the Sorcerer class in the third edition (A)D&D (hence the name) it is now the standard system of the 5th edition of D&D and the system of choice of one of the best OSR game out there, the Adventurer Conqueror King System. The philosophy behind my rules is to keep changes at minimum and to have them ready to be used in any old school D&D inspired games. Here I wanted the possibility to cast spontaneous spell as a resource but not as the normal casting method, and without resorting to rituals or other system that give ulterior resources to casters. Furthermore I wanted it to be as Vancian as possible (but as discussed in Recharging Spells a Vancian optional system with some difference). there I used two spell of the same level for a similar effect, and I didn't give a repertoire out of the box, following the previous link you will find also other useful spells :-) have fun! Gli sproloqui del Grognardo: perché alla 5a Edizione bisogna fare i personaggi con i punti! Fabio Milito Pagliara. Tema Fantastico S.p.A.. Powered by Blogger.